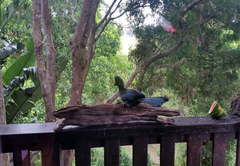 Treehouse Cottage is a highly recommended property providing self catering in Plettenberg Bay for up to 2 guests visiting the Garden Route region. 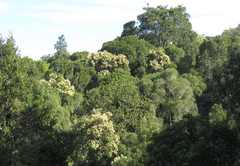 Treehouse Cottage is situated in Ashlands, which is a rural estate in the indigenous forest in the Crags, in-between Nature’s Valley and Plettenberg Bay. 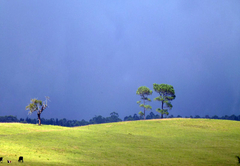 This is arguably the most beautiful part of the Garden Route. Many artists have made their homes here, including your hostesses. You are welcome to ask them to see their workshop where they produce their fine art works. 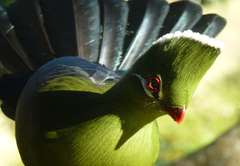 Our bird life is extraordinary – Knysna Loerie’s are seen daily, as well as many other beautiful forest birds. 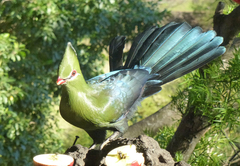 It is very quiet and safe here, so we ask our guests to please respect our neighbours peaceful surroundings and privacy. 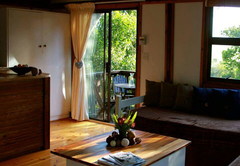 The cottage has a kitchenette, with a two-plate stove, microwave and bar fridge. 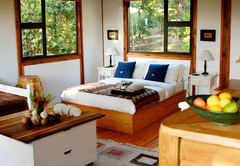 It is a small open-plan cottage with a living area with DStv and a decoder. 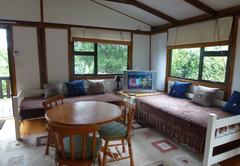 There is a double bed and two single beds (suitable for children) and a modern bathroom with a shower. 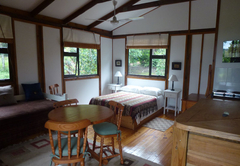 There is also a fan, a heater and an electric blanket to ensure your comfort throughout the year. 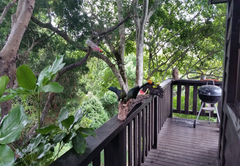 The charming wooden deck overlooks the indigenous forest and has a Weber, ideal for an evening when nothing but a barbeque / braai will do. 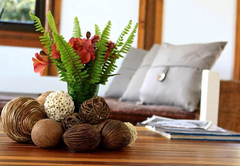 The cottage is fully equipped for self-catering and is not serviced (except for longer stays). Tea, coffee and sugar are provided as well as toilet paper and soap. Guests must bring anything else they require. All linen is provided, including towels. No smoking indoors please and no pets. 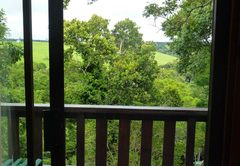 Treehouse Cottage is a small open plan cottage surrounded by the indigenous forest in a beautiful part of The Crags. It is suitable for a couple or a young family. 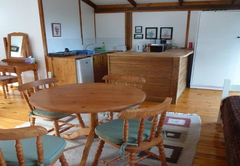 The cottage has a kitchenette, with a two-plate stove, microwave and bar fridge. 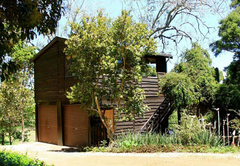 It is a small open-plan cottage with a living area with DStv and a decoder. There is a double bed and two single beds (suitable for children) and a modern bathroom with a shower. 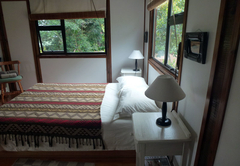 There is also a fan, a heater and an electric blanket to ensure your comfort throughout the year. Sally and Margaret were both on hand with a pleasant welcome when we arrived. They couldn't be friendlier or more helpful. They even let me park the Harley in their garage because it was going to rain. The cottage is nicer than the pictures show, and offers all it promises. Loved the fluffy "like new" towels, all the DSTV channels, fresh water. 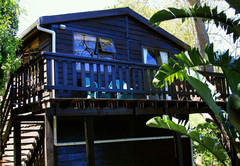 Response timeTreehouse Cottage typically responds to requests in 5-10 minutes. Child policyChildren of all ages are welcome, under parental supervision.